Inside a small rancher home in Vinita, Okla., police found a revolver, a semiautomatic pistol, four pounds of marijuana, and more than $276,000 in cash in vacuum-sealed garbage bags. Clearly this was the abode of a hardened criminal. A dangerous man. Perhaps some disenfranchised scion of a South American drug cartel. But no. The drugs, guns and cash belonged to 73-year-old Darlene Mayes, a grandmother with fluffy white hair, oversize eyeglasses, and a gentle expression. 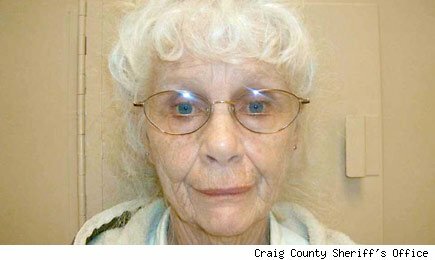 As Mayes explained to the cops when they busted her earlier this month, the cash was her retirement fund. Today, Mayes is accused of running a drug-dealing network that ranged across Oklahoma, Arkansas, Kansas and Missouri. Police say she supplied almost half of the area's pot. Her son, Jerry, is believed to have been one of her many dealers. Mayes is charged with possession of marijuana with intent to distribute, maintaining a dwelling where drugs are kept or sold, and possession of a firearm in commission of a felony. An officer involved in the bust said she may have been operating the drug ring for as long 20 years. Yet, for Mayes as a retiree, there may be a small silver lining: At least jail offers free room and board. Many seniors have had to retire early or have seen their investment accounts substantially reduced by losses in the stock market. Many more have only Social Security as a means of income. However, it's safe to say not many senior citizens have turned to drug dealing to help make ends meet -- though the reality of today's retirement life certainly makes the illicit drug-dealing life more attractive, criminality be damned. As Chuck Saletta recently pointed out here on DailyFinance, the average expected retiree's Social Security benefit is a meager $1,229, or $14,748 a year. That's before any Medicare premiums are deducted. That's hardly enough to cover basic necessities like food and shelter, much less vacations or gifts for grandchildren. No wonder Mayes was drawn to the highly lucrative world of drug dealing. For cash-strapped seniors on the brink, however, there are a few viable alternatives that don't involve a risk of prison time. Share expenses. Consider joining forces with a friend, family member, or neighbor, and moving in together. This can help with saving on rent and groceries, two of seniors' biggest expenses. Ask for help in your community. People around you might be happy to help, if only they know you needed it. Consider letting your pastor or rabbi, doctor, social worker or neighbors know in what ways you are needy. Call your local United Way or Catholic Charities to learn about the full suite of services available at your doorstep. Seek part-time work. Bag groceries at your local supermarket, flip burgers at the nearest fast food restaurant, or work from home as a freelance writer. Sell old household items on eBay or hold a yard sale. For homeowners, a reverse mortgage can be a last-ditch option when work isn't available. Sure, these tips won't bring you trash bags full of $50 bills, but they won't land you in handcuffs in the back of a squad car either. If you've been an honest, upright citizen up until your retirement, now is no time to go all drug kingpin. While it's hard to beat $276,000 for peddling illicit plants, freedom in your golden years is truly invaluable.